← Exciting International Promotion – starting today! 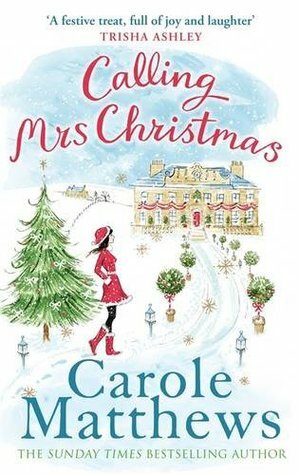 Calling Mrs Christmas is written by Carole Matthews and publsihed by Sphere. When Carter asks Cassie to join them on a trip to Lapland, she knows she shouldn’t go. As much as tries, Cassie can’t deny how drawn she is to Carter and everything he has to offer, but she still loves her warm-hearted Jim. Suddenly Cassie finds herself facing a heart-breaking choice that could change her entire life. There are only a handful of Authors that when their books arrive through my letterbox that they automatically get placed on top of the pile without question and Carole is such an Author. Twice a year I know that I am going to get a book that will allow me to sit curled up on the sofa (now a chaise longue in my Summerhouse!!) and loose myself into the ‘Matthews world’. So, without a moment’s hesitation I sat down to read Calling Mrs Christmas with blanket wrapped around me and before I knew it, half the day had passed me by unnoticed! Yet again Carole has done it … written a book that hooks you from the very first chapter and causes you lose huge amounts of your weekend! With just a handful of characters which is perfect for me as I often get confused if there are too many! Cassie is in her own words unemployable and desperate to do anything with little success. She is living with Jim who to me sounds like the perfect man who works at the local Young offenders unit in particularly he works with two young boys, Kieran and Andrew. Cassie comes up with an idea to set up her own little business covering everyone’s needs for Christmas from dressing tress to buying and wrapping presents etc. Obviously Jim supports Cassie through this enterprise despite working full time. There are a couple of things that I particularly loved about this book. The first is the depth and detail that Carole has gone into in each major area of the book like the Offenders Unit and Swedish Lapland it is so apparent that a considerable amount of research for both areas has taken place which just adds to the enjoyment of the book and make it feel so real. The second thing is the quality of the male leading character, which is often overlooked slightly in many novels. I could have happily have read many more chapters of Jim’s world in the Unit which is a credit to the writing. Without any hesitation I would strongly recommend this book as it a fabulous story, almost an Indecent Proposal! Brilliantly written with heartfelt moments that bring a tear of sadness to your eye but also such strong emotions of joy that also brings tears to your eyes. So many unexpected tears I experienced and a huge disappointment when the story ended for no other reason that I just could bare to say goodbye to Jim, Cassie, Kieran and Andrew. Be prepared to lose yourself in this Christmas story and I bet you don’t come through it dry eyed! Has be to given the Louise loved…. status. Well worth a wasted weekend! Brillant book from Carole and your reveiw is just enough to make readers pick it off the self without giving too much away.